While this meant we sacrificed our vacation this summer for school, we deeply enjoyed working towards our goals. It would be impossible to write an article on everything we learned, but a good summary can be found in Will's (our instructor) book. We bought the book at the end of the class and found it covered all the technical timber framing aspects we learned in the class. "More pictures than words, just how we like it." ~ Will. 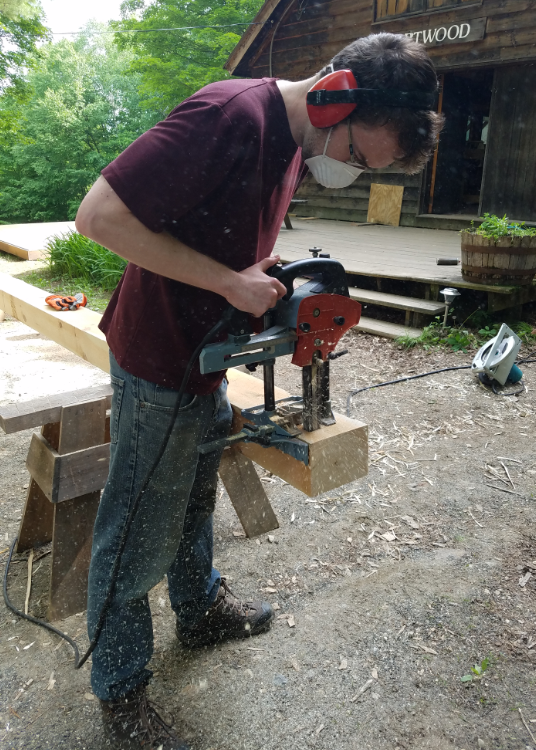 As the week progressed, we also learned how to use power tools such as the chain mortiser. Essentially a chainsaw on a jig, used for cutting precise 1.5" wide mortise holes, specifically for timber framing. In the shop we built wooden toolboxes as a way to practice getting to use all the power tools of your standard wood shop. 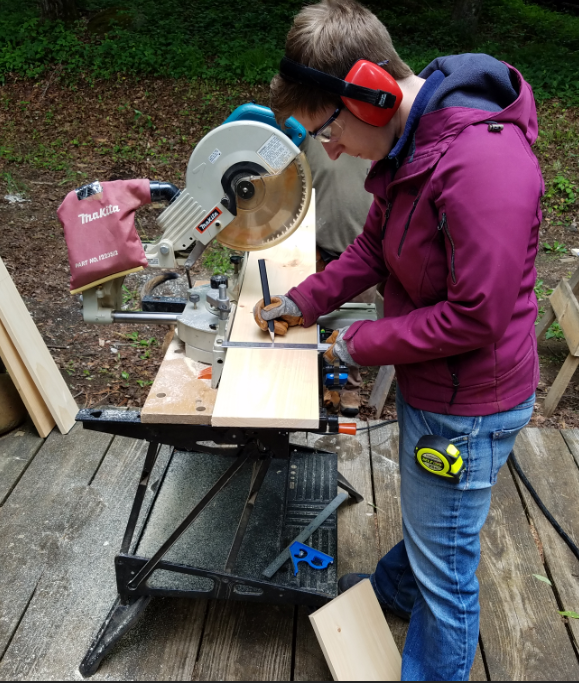 While this may be old hat for some folks, I (Lauren) haven't been in a carpentry shop since middle school. 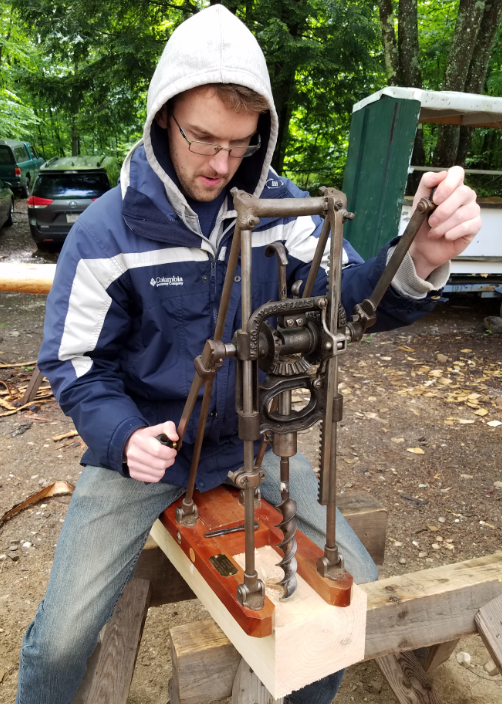 It felt great to be formally trained on a tool, rather than just using to get by. It definitely was a confidence builder for sure! 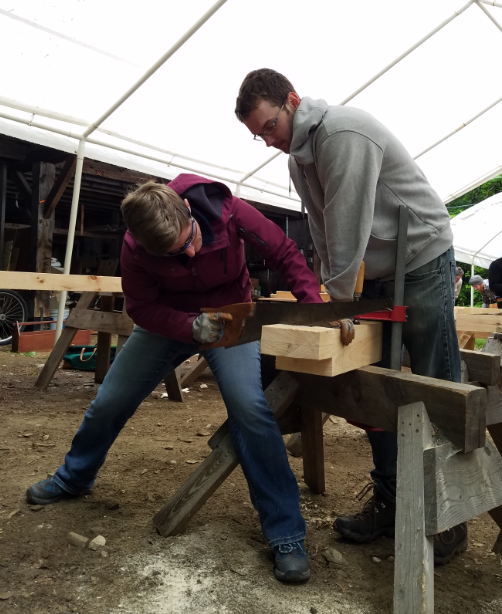 At the start of the class, Will covered the major difference between timber frame (big beams holding the structure) and stick framing (tiny 2x4 studs holding the structure). This comparison was a brief look into traditional vs modern building techniques. Modern stick (stud) framing requires evenly milled lumber that has been pre-dried, and pre-shrunk. Folks who built before modern lumber yards with huge kilns to dry wood used timbers that were often very green. If you built a stick framed house from green wood, as the wood lost water and shrunk over time the second floor/roof would shrink and potentially drop off the tiny walls supporting them. Building one floor direction on top of another floor requires that the wood won't changes size and mis-align the levels. With timber framing, the support beams go from floor to ceiling, even in multi-story buildings. This means, as the wood shrinks over time, the entire house moves together rather than floor by floor. This means you can use green wood, just cut, for your building. I loved the very hands-on approach to the entire class. Will seemed to give us just enough information to get us started then sent us on our way. We cut the timbers to length, knowing he didn't buy much extra for spares. There was some room for student mistakes, but not much. Our class was building a shed for a client of the school (who likely got a discount on labor). This 16 x 20 frame was our class project, to be completed over 4 weeks. We only attended for 1 week, but enjoyed the final pictures to see the frame fully assembled. Tim and I were assigned timber sections that were our responsibility to make sure they fit together with the rest of the frame. We were assigned both the smallest 2' timber and the largest 20' timber. We built a lot of teamwork over the week. We also loved our instructor Will. 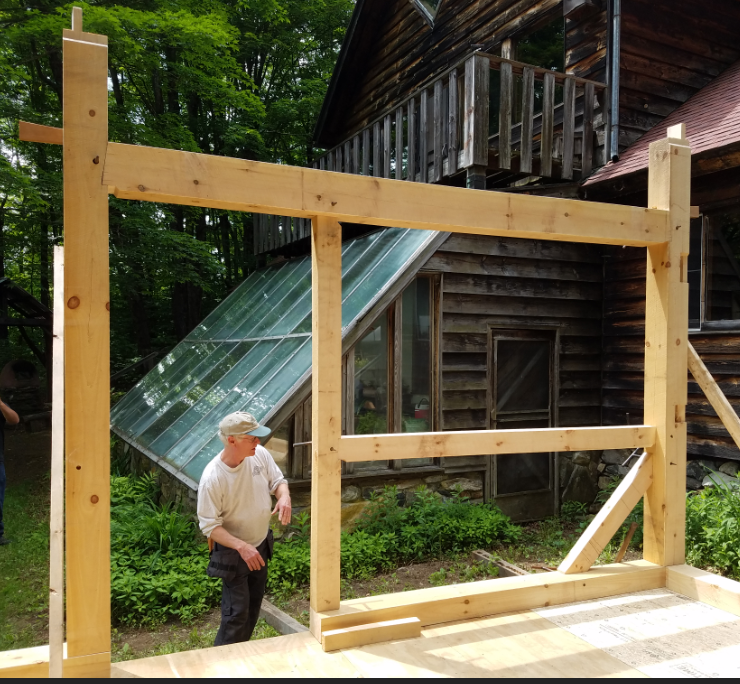 With the experience from decades of timber framing, he shared his tips, tricks and a good bit of laughter with his students. He gave you just enough information to get started, and let you go at it. He was helpful and responsive to student questions. If you can't attend his class to learn, you can check out his book. Our classmates came from all across the East coast and from many careers. 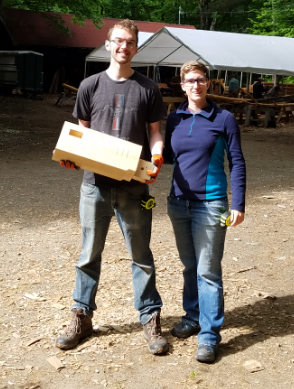 Some wanted to switch careers, some wanted to deepen their knowledge of timber framing for their career, and some (like us) wanted to learn to build for personal dwellings. The coolest part, was that they are were all willing to help. Everyone was ready to jump in, volunteer, hold a beam, or clamp a timber. They were like-minded in the desire to learn and to build. We wish we could have stayed longer to get to know our classmates better, and learn from each other. They didn't think our dream to build our own house was crazy, they didn't even question it. It was refreshing to say our plan and not get reflected back all their worries and fears. They just reflected back understanding, and for some, a desire to do the same. The entire class was set up around hands-on learning. This is the way learning should happen. The class also partnered us up (hey, Tim and I got partnered, what a surprise), to build teamwork and building skills. One person can move a beam, and chisel out the joints. But one person can make mistakes and one person can't raise the whole frame at the end. You need quite a bit of teamwork, to assemble the joints and tip the frame up into position. There is no way (maybe with tons of rigging, pulleys, etc), that one person can build a timber frame house without friends to help. We also loved the workshop, and the general school house layout. While the school seems to have been constructed ad hoc by student classes over the years it serves it's purpose well. As you enter the main doors, you come first to the carpentry shop. Behind that is the kitchen, off to the side is a bathroom, some living quarters, and the staircase to the classrooms (and more living spaces). But we loved the workshop directly attached to the house. You could easily go from one to the other, inside. This seemed like a great perk in the winter. Of course looking at that amazing shop, we couldn't help but ask. Which one came first: The tools to build the wood shop or the wood shop to hold the tools? On Thursday night, Will started his cob oven and got some fresh pizza cooking. All the food was good the entire week, and the pizza was no exception. Homemade dough, make your own topping, cooked to perfection in an outdoor cob brick oven. 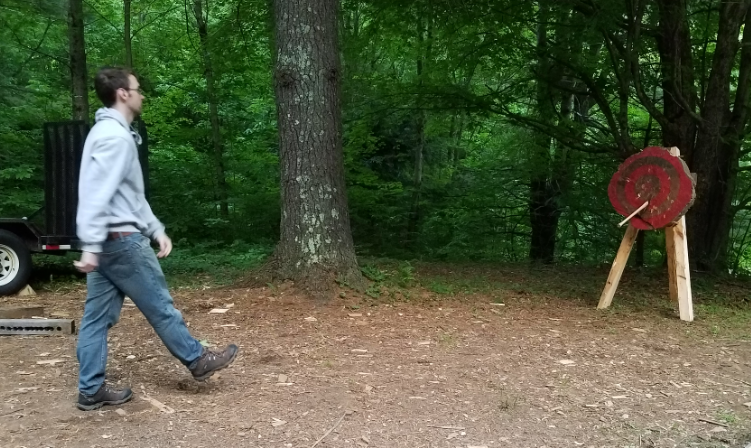 It was a good bonding time for the students, while throwing a few axes for entertainment. One thing I particularly enjoyed was the scenic cupola on top of the school house. From the ground floor, you can take a spiral staircase to the classroom, then a ladder to the upper attic. The upper attic held living quarters, largely for some of the apprentices in the shop. From there, a second ladder takes you up into the cupola at the very top of the building. A double trap door serves as door and floor. Perched on top, this steeple structure gave a view of the surrounding forest and the school yard below. I loved the tree-house feel, the trap door, and the windows. It was a cozy place you could escape to, to ponder the world, or just admire it. I don't have any pictures of it, I just enjoyed it in the moment. All the while we were learning, we also were enjoying being outside. The school is nestled in the Berkshires, with scenic drives, local charm and lots of trees. 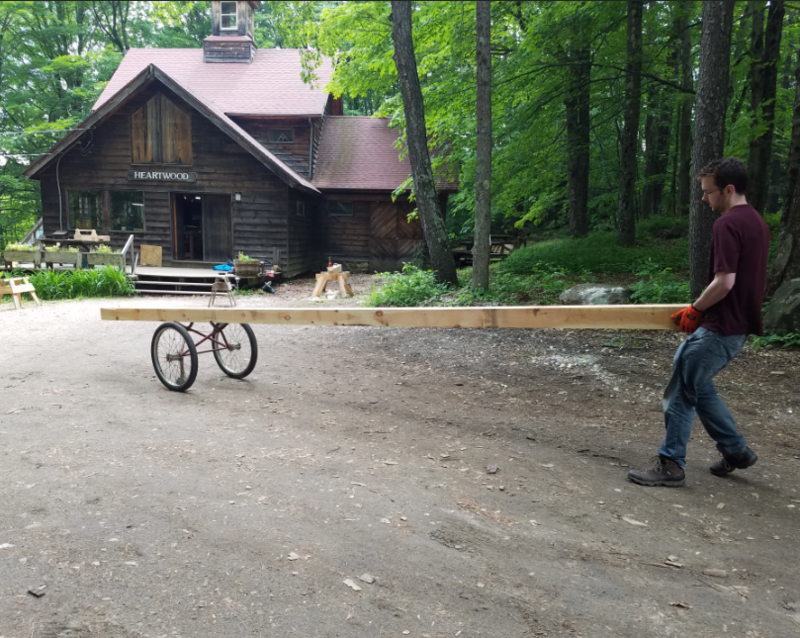 We learned the timber used in the class were locally milled from Eastern Pine, similar to the very same forest on the school grounds. There was a pride in knowing, the building was sourced locally and we used native lumbers, to build a structure that will shine for generations to come. It's tradition to drop a penny with the year's date on it, into the mortise hole of one of the sill plates. As a token to the building, and if the building were ever to be taken apart, the experts will have an exact year it was constructed. Tiny things like these, we may not learn from a book. But it seems like an almost lost tradition, one I hope to carry on in my own home. 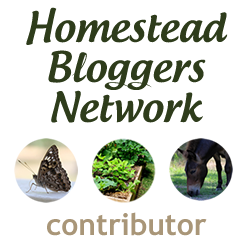 We would joyfully return to the Heartwood, if our path takes us there. Or onward, to learn with our own home. What have you learned recently? Let us know below. Nice write-up Lauren. My son and I were there in August ’18 and had a similar experience. So much knowledge in only one week! I am glad you enjoyed it like we did. It really is a great school.